Tony Gregson AM, chair of the Crawford Fund’s Victorian Committee, is one of five new members appointed to the Commission for International Agricultural Research, which provides expert, strategic advice on priorities for the Australian Centre for International Agricultural Research (ACIAR). The Fund works closely with ACIAR to support their important role in encouraging Australian agricultural scientists to use their skills for the benefit of developing countries as well as Australia. Tony recently addressed a Rural Press Club Victoria forum on “Biosecurity: International Threats and Strategies” where important, ongoing work in Australia and in our region was highlighted. Tony is a grain grower from Victoria’s Wimmera region with an extensive science and corporate research management background. In addition to his Crawford Fund position, he currently chairs Plant Health Australia and formerly chaired the Board of Trustees for Biodiversity International. He is an Adjunct Professor in Environmental Management at the University of Ballarat, Chairman of the University of Melbourne School of Botany Foundation and a director of Rural Industries Skills Training. 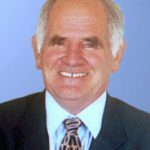 He is a former chairman of two CRCs, a former inaugural member of the CSIRO and Grains Research and Development Corporation Boards, and a former member of the International Maize and Wheat Improvement Centre, Australian Nuclear Science and Technology Organisation, and Rural Finance Corporation of Victoria Boards. The other new appointments to the Commission are Mr Don Heatley, OAM, who was appointed as the Chair, Mr John Cook, Ms Lucinda Corrigan, and Ms Catherine Marriott.